Get personalized touch for the outdoors of your residence by designing the perfect pergola. If you are fascinated with your garden then you must construct an outdoor pergola. Normally pergola is constructed in a shaded area where you can relax and you can conduct your lunch or breakfast also. This is a perfect area for your tea and coffee junction and you can enjoy your vacation or holiday in your garden with your family and friends easily. Do you want an outdoor space without constraining its limits? Go ahead with a pergola structure that is just enough to shy away from the mid-day sun. The Cabin up North design is more permeable and lighter with typical porches and a mix of transition elements from the interior and exterior of the residence. It is best for a two-storey house, filtering mid-day sunlight. You can also include a patch of water-body to the pergola The Intimate Space is where you can have fabric “sun-brella” to keep away from the scorching light. A small fountain can add to the cool quotient of this space. While thinking of outdoor pergola designs it will definitely be a good idea if you can consider the Muirlands Modern pattern. This pergola design comprises classy grey elements complementing bold red furnishing. How you an increase the privacy quotient of a pergola? Did you take time to find out how you can utilize the backyard or the garden? The pergola is an excellent way to convert the cluttered and unused space and give it a new look. What is most important is that you can make the best out of the pergola by introducing privacy designs? Understand the lines of your house to find out the best space for outdoors. Now check what will be the best roofline for the pergola. While considering different pergola designs do not go overboard with clearing the greenery. Most of the times, these greeneries offer the required private space that you need outdoors. Suppose, an old tree has been standing for too long. Do not cut it off. Instead, make space around it so that a day out in the sun turns relaxing under a cool green shade. Plant hanging baskets from the wooden panels. Flowering pots add a touch of natural elegance to the décor. Embrace vines for bringing in privacy. A touch of scrambling greenery is likely to add depth to the décor. Your pergola is not complete unless you have installed a roof. Make this private space cozier with an interesting roof that filters the sunlight to a great extent. While thinking of privacy, it is noteworthy that you add a water-body to the surrounding. 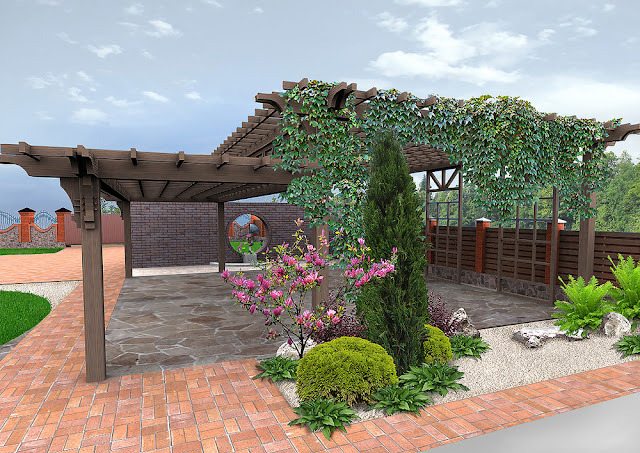 With patches of lush green around and the soothing sound of water trickling, the pergola is certainly going to turn more attractive and peaceful. Firecracker vine: A Mexican native, also known as exotic love showcases colors ranging from scarlet to orange and yellow. Black-eyed Susan vine: brightly hued, this flower has dark eye complementing vibrant orange petals. Passion flower: Known for its spectacular beauty, passion flower is tender with lavender-fringed petals. Your beautiful home will appear more attractive when you have the ideal pergola at home. So, don’t waste a minute and start planning for a welcoming outdoor space.